In 1939, a translator of children's literature named Hanako Muraoka was given a book as a keepsake by a missionary friend from New Brunswick named Loretta Shaw. Miss Shaw left Japan just as hostilities erupted, and Hanako spent the duration of the Second World War reading the book and translating it into Japanese. English was now the language of the enemy, and so she conducted her work in secret, protecting the book from harm while bombs destroyed the cities and landscapes around her. On March 31 of this year, Japan's national broadcaster NHK will begin airing a 156-episode "morning drama" serializing the life story of Hanako Muraoka, whose primary contribution to Japanese culture was her translation of Anne of Green Gables. 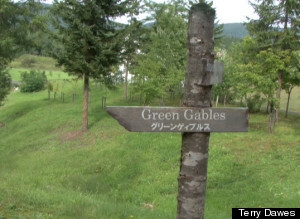 Anne of Green Gables is big in Japan. Growing up in Charlottetown, I began noticing increasing numbers of Japanese tourists year after year, but I had no idea why they came. One day, a friend of mine and I were stopped walking down the street by a group of Japanese tourists. Unable to communicate with us, they signaled that they'd like me to take their picture as they gathered around my friend. 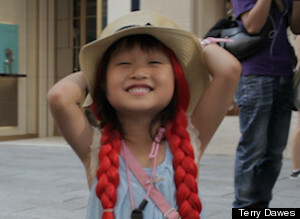 Like a lot of girls on Prince Edward Island, she had bright red hair. We walked away, puzzled and amused, and didn't think much of it. Last September, I found myself in Hokkaido, walking through a theme park called Canadian World. The park opened in 1993, during the heady boom times of Japanese economic prosperity. The park featured a lake alongside a row of Quebec City-style buildings and a miniature railroad that snaked around the lake, as well as a full-size reproduction of the Green Gables house in Cavendish, Prince Edward Island. Having walked through the original many times, I cannot communicate how strange it is to wander through a Japanese replica, alone. At its peak during the mid-'90s, the park attracted up to 8,000 visitors a day, I was told by an ex-employee. In 1997, the Asian economic crisis emptied out the dozens of theme parks that had been sprouting up across Japan, as the supply of easy money suddenly ceased. Last summer, 20 years after its opening, Canadian World was empty. There's a groundskeeper who keeps the place in immaculate shape and also makes sure that the tinkly piano music that plays through loudspeakers strategically placed throughout the park never stops. Walking through the Green Gables house in Canadian World is a surreal experience. Strangely familiar, it's like a dream in which you wake up alone in your hometown. You wander the streets and it never occurs to you to wonder where all the people went. The Green Gables house is immaculately preserved. Anne's dress is laid out on her bed. The broken pieces of the slate she broke over Gilbert's head are placed just so inside a doorway. It could not be stranger. A touring Japanese-language version of the Anne of Green Gables musical had just wrapped up its nationwide swoop when I arrived in Tokyo. In an interview, Takashi Suzuki, CEO of the S.T. Corporation which finances the musical and the tour, described his childhood during World War II. Japan's famously wooden architecture had been almost completely destroyed in the flames, as had his family's library. Japan was devastated by the war. Hanako Muraoka's Anne of Green Gables was published in 1952, by the Mikasa Shobo publishing house. Young Mr. Suzuki and his friends had nothing else to read. An older friend of his sister handed him a freshly published copy of Akage no An ("Red Haired Anne," as she's called in Japanese). Everyone read it. The story of an unwanted orphan struggling to find her place in the world struck a chord in post-Second World War Japan. In Okayama, I visited the "School of Green Gables," a functioning school of nursing that turns out highly sought after graduates for the region's hospitals. The school's buildings are strikingly un-Japanese. Basically, they look Canadian. Speaking with the school's director and a few of its students, it became clear that the spirit of Anne Shirley was responsible for more than merely offering the institution its name. The students talked glowingly of their vocation, caring for others, and stated explicitly that Anne was a role model to them. It was the first moment in the trip that I felt like weeping. Most people, if you ask them how they know Akage no An, will tell you that they saw her on TV. The 1979 anime, released by Nippon Animation Co., and directed by Isao Takahata with an assist from future anime legend Hayao Miyazaki, has played on Japanese television more or less continuously for decades. March sees its release on Blu-ray. 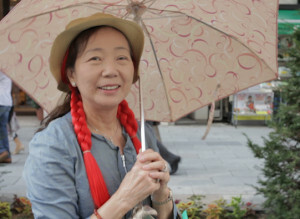 With the convergence of Anne-related media activity shaping up around the imminent broadcast of Hanako Muraoka's life story over 156 episodes stretching into September, Prince Edward Island's premier Robert Ghiz swung through Tokyo last week on a trade mission, boldly predicting that he expects 20,000 Japanese tourists on PEI this summer. 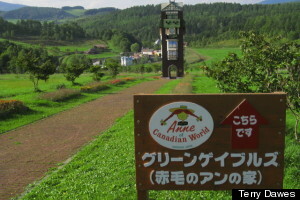 Noticing a few years ago that so many Japanese tourists to PEI were older women accompanied by their daughters, I was assured that the Japanese fascination for Anne was on its way out as the daughters lost interest and then failed to transmit their enthusiasm to the next generation. But with signs that the love affair is rekindling, it seems as if Japan's fascination with Anne is on its way back. Terry Dawes is a freelance writer and filmmaker living in Montreal, Quebec. He's currently working on a documentary about the Japanese fascination with Anne of Green Gables, called Anne of Japan.